Leah's Knits: Scott Pilgrim and Harley Quinn? Scott Pilgrim and Harley Quinn? 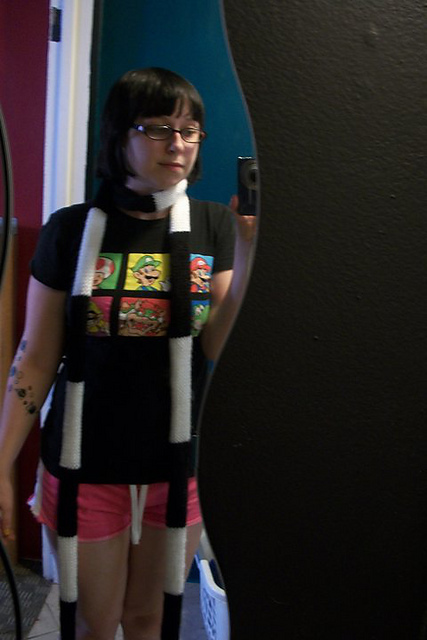 I finished my Scott Pilgrim scarf and it's super cute. It was really easy to do the ends because the scarf rolls so much, I basically only had to tie the alternating colors together instead of the usual painstaking weave, as the little knots will not come into contact with you. Knit on size 9 circular, CO 20 stitches, and began knitting around 20-25 rows, but the two yarns I was using had different guages so I eyeballed it. Especially since I was making it for myself, I don't mind it not being perfect. My friend Kiki does a lot of amazing art, and I'm constantly envious of her work. Lately she's been painting various characters from things, and especially from Scott Pilgrim. I really like Knives and thought her character was adorable, but I didn't see Kiki paint one of her! So I requested one with offer of payment, and instead she came up with a great idea: crafty exchange! I sent her my specs for what I wanted in a Knives portrait (she also made me that icon of me you see in the corner - Chibi Leah! ), and she showed me a picture of the kind of gloves she wanted. I took a couple liberties with the image so that I wouldn't be blatantly stealing the original creator's image. Kiki sent me a cute diagram with all her measurements, so I followed that as best I could. I used size 3 double-pointed needles, CO 34 stitches, knit about an inch in 1x1 rib, then switched to stockinette. I purled the cast off with white yarn for the ending effect (which I think looks awesome), and knit on thumbs by pulling stitches around the hole. I did pretty good for hating fiddling with fingers! I duplicate stitched the images on, which are supposed to basically resemble cards (Joker, card, Harley, get it?). Even though the Joker card doesn't actually have any of the four symbols in it - you get the idea. Pretty cute, huh? Can't wait to give em to her!